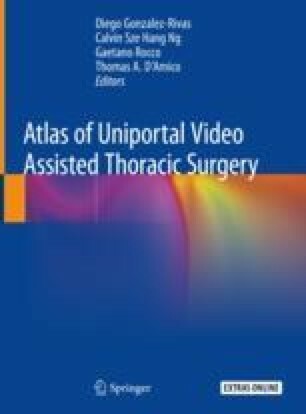 Uniportal VATS is becoming nowadays a more common procedure in several thoracic units worldwide. With this technique, all advantages of minimally invasive surgery are applied and the oncological principles of open surgery are respected. The use of this approach is described not only for minor lung resections but also for major lung resections (Gonzalez D, Paradela M, Garcia J, et al. Interact Cardiovasc Thorac Surg 2011;12:514–5) Various standardized steps, starting with the preoperative setting and ending with the immediate postoperative care, can help establish development of this procedure. As the surgeon gains more experience with setting up of this procedures, this could enable to manage even complex cases. The objectives of this chapter are to set the basic steps for room set-up and instrumentation for starting or improving a uniportal program in thoracic surgery units.